Planning for your wedding can be a fun and inspiring experience – think of it as a starting block on the wonderful journey you’re about to take. Save the date cards can be a fantastic way to begin the build-up to your big day and build anticipation for those invited – ensuring your most treasured loved ones add the date to their calendars. Help kick-start your wedding celebrations with our guide to how to create the perfect save the date card. A save the date card is sent six to twelve months before your wedding to give your guests key information about the day. This typically includes the bride and groom’s names, date of the wedding and the location. Usually, this is followed-up with a formal invitation closer the to the date which gives the finer details. There are lots of elements to consider for your save the date cards, from the design to when to send them out, here’s our top save the date etiquette tips. 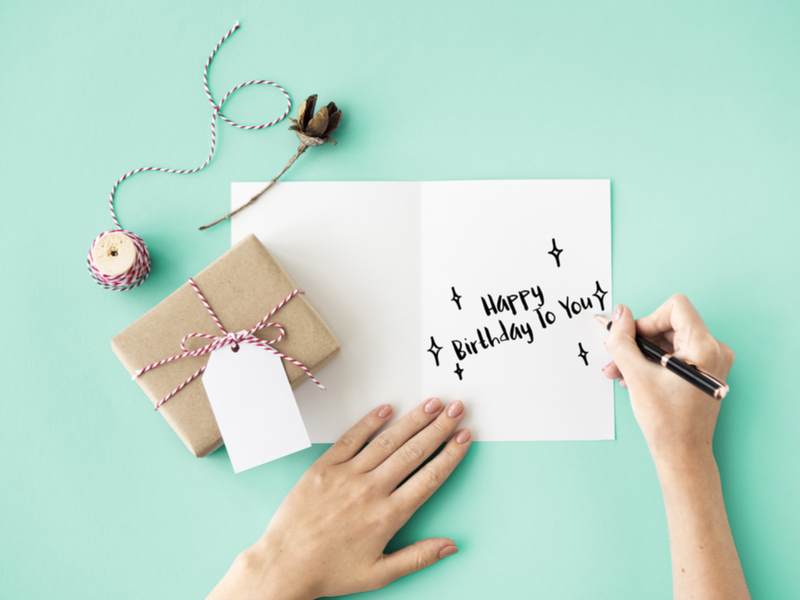 Give your guests enough notice: Aim to send your cards out around six months before the big day for domestic weddings in the UK and twelve months if you’re getting married overseas. Follow up with a formal invitation around one to two months before the wedding. Know your guestlist: Make sure you finalise your guestlist before mailing your save the dates. Once sent, this cements your chosen invitees for the ceremony and is a great way to let them know if they can bring a plus-one early on. Add a personal touch: While you may not have your wedding theme set in stone, this is a great way to hint to your guests about what they can expect. 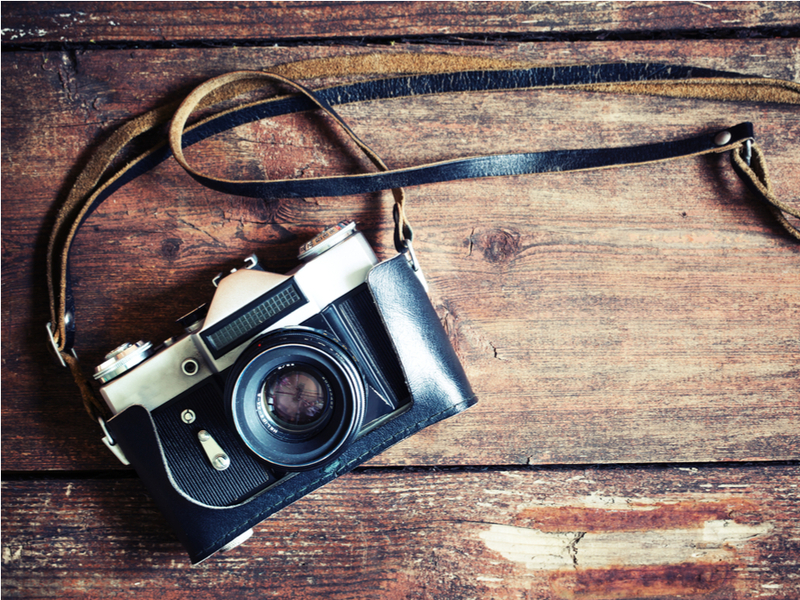 Include a couple of your quirks, add a picture of your engagement snaps and choose a theme which matches your personalities. 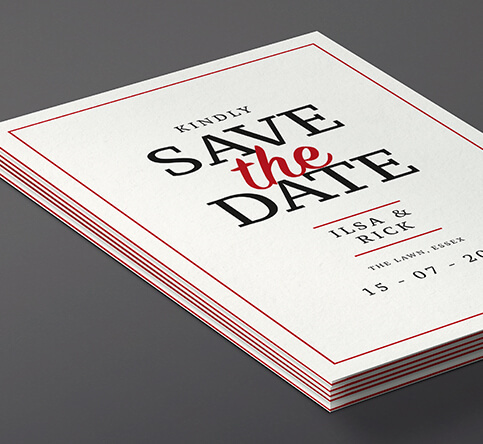 Silk: This is our most affordable and most popular option when it comes to save the date cards. With an attractive finish, mixing both the shine of gloss paper with the clarity of matt, it’s simple and classic. Gloss: Decadent and shiny, gloss is perfect for a luxurious card design. Choose this for a striking sharpness in your artwork and give your guests a taste of the excitement to come on the big day. Matt-laminated: Perfect for contemporary save the dates, our matt-laminated finish ensures that your font stands out, creating less contrast and shine than our gloss and silk counterparts. Brown kraft: Ideal for outdoor weddings or vintage themes, our brown kraft paper is also natural and eco-friendly, giving an authentic and rustic feel. Pulp: Another eco-friendly option, our pulp paper is made from recycled materials and is ideal for carbon-footprint conscious guests. Triple layer: By far our most durable and study paper, this triple layered material will stand the test of time. With a sophisticated finish this one is sure to make an impact. The guest list is finalised, the venue is booked, and you’ve agreed on your style of wedding – what’s next? 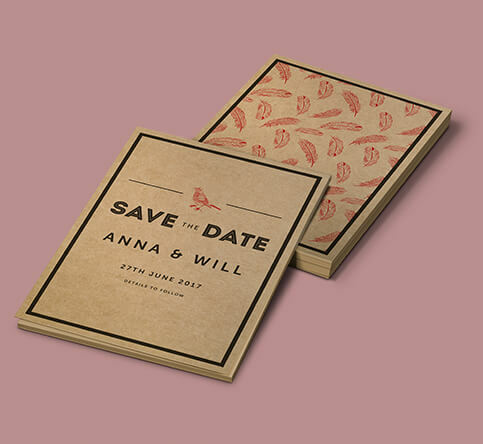 Now you need to visualise your save the date card designs. 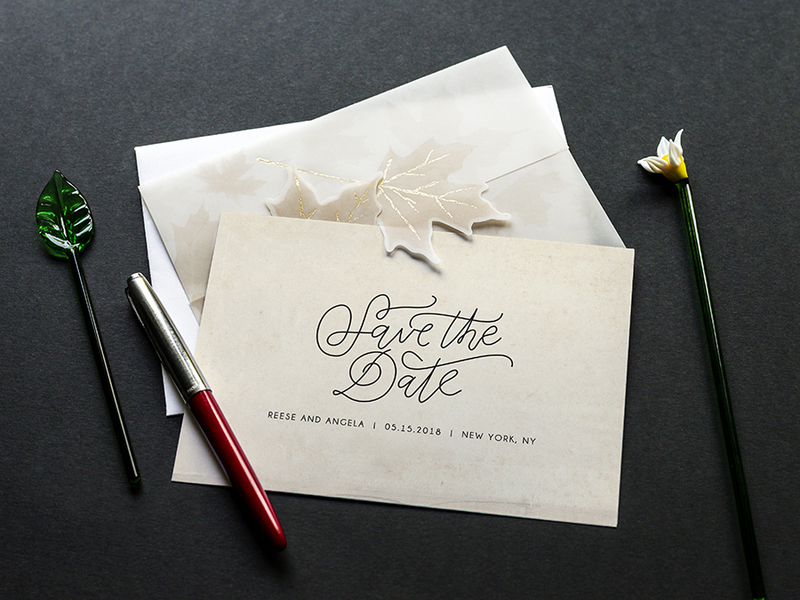 From stylish templates ready to go, to getting creative with a blank canvas, we have all the tools you need to perfect your save the date cards. 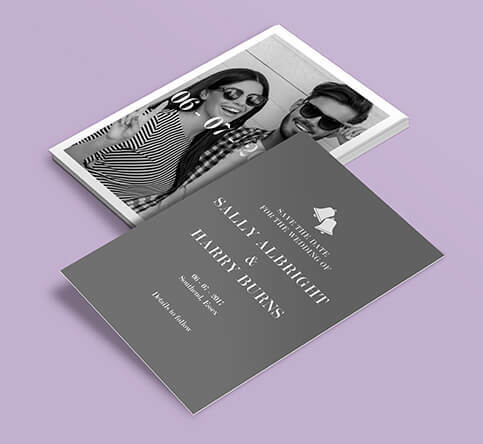 At Solopress, we have several save the date card idea templates that are ready-made to get you started with your card. From vintage floral to rustic charm, there are many different design styles to choose from. All you need to do is personalise the text information to tailor it to your wedding. Or, our handy blank template tool allows you to start from scratch when designing your bespoke cards. 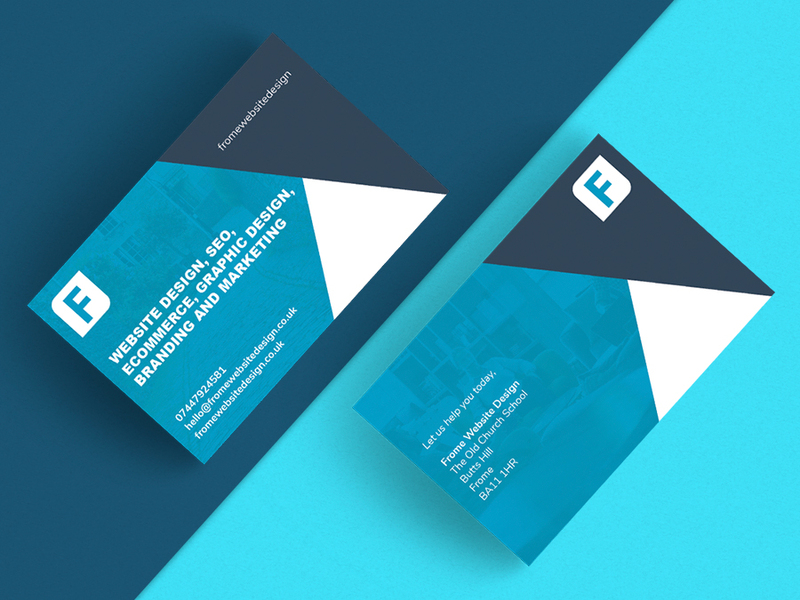 As always, our staff are always on hand to help, should you have any queries about creating your invitations. Remember to keep in mind your wedding themes and keep it simple, opting for bold typography and colours with minimal information. Save the date cards are a fantastic way to give your guests a snippet of what’s to come on your big day and help build up the excitement. Browse our save the date cards page and create the perfect set for your special day.